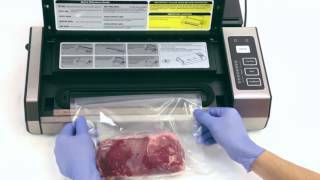 The Kitchener 55023006, Commercial Grade Vacuum Sealer is designed for heavy usage. It is the perfect tool to extend the freshness of foods and eliminate freezer burn. This easy-to-use unit features automatic operation with quicker cycle time. The easy-to-read LED and push-button controls keep you in complete Command of the process. Can accommodate up to 12-inch wide bags and rolls.